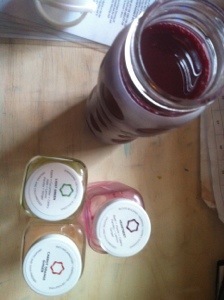 The Big H: My Cold Pressed Juice Diet! I have always been a health but since losing 40 pounds at age 13 from realizing my life was at risk of heart disease and diabetes. I remember eating my usual super sized 1/4 lb with cheese, coke and fries. Or 4pc chicken meals king sized at KFC immediately followed by the largest sundae from Dairy Queen… Don’t make me say the time I saw pride in eating a whole plate of dry ribs, chicken tenders and fries THEN a big sundae from EARLS. Yeah I was eating to the poor of acid reflux and purging. I’ve alps had the opposite end of not eating at all and limiting my caloric intake to 1200 a day… – AT 14-17 years old?!?!? Well now that I’m a health balanced eater thanks to my #SuperHiiroWellnessSquad I am helping everyone else based on my 10+ years lived and applied wisdom! I’ve always blended power shakes and smoothies in my VitaMix and juicing more from retail vendors now that its easily readily consumable. 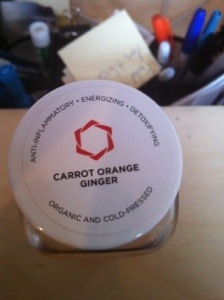 Prior to investing my money into these juices I primarily bought Jugo Juice or rarely Booster Juice. NOW that there’s these 6 personal favorites I drink daily and weekly I feel nourished with heavier sushi or Chinese food meals with seafood and vegetables to balance. My snacks range from TERRA or KIWA vegetable Root Chips and I LOVE the Power Muffins at Whole Foods. Popcorn from Indiana popcorn and BoomChickaPop are delicious no doubt. ALL THESE BRANDS I LOVE FOR DIFFERENT REASONS AND THEREFORE ONE ISN’T BETTER OR WORSE THAN ANOTHER! The Juice Truck came onto the scene around a year ago as a FOOD CART with Vancouver’s new food niche breaking into the streets! A first of its kind certainly in Vancouver, offering soups, salads, smoothies, juices, bars and snacks, Juice Trucks unique Gastown hot spot + delightful regular staff/team make it a desirable way to be healthy and keep well. They offer at least 7 different kinds of daily beverages in each juice or smoothie option. My personal favourite is the infamous GREEN SMOOTHIE. It contains Kale, avocado, lime, ginger, medjool dates and coconut water and I add half coconut milk for thickness! Their RAW ENERGY BAR is nut free for ME which is perfect due to an allergy to Peanuts (anaphylactic) and if you have no allergies, give their other ones a try! The reason for writing most about Juice Truck is that I know the most information both personally as a customer and also because they have a store front and actual presence that goes beyond the SHELF/COUNTER. The staff – Lauren and the other women and men… I wish I remembered their names writing this! Ah well, they know I know who they are and vice versa 😉 !. Anyhow, You truly can’t go wrong with them as you’re allowed to add or remove ingredients from your drinks in case you want more spice or less sweetness in your pure blended oasis. 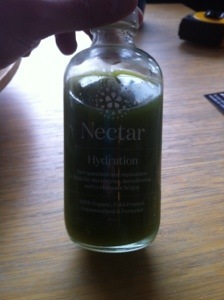 Juice is available at CHOPRA YOGA in Downtown Vancouver and comes in 10oz plastic bottles. Their juices are light and filling and a great choice pre or post yoga, otherwise stop in and pull one while on the go in your work day! Sizes are 10oz and range between $5-6. Started by Lara Kozan (Co-Founder of YYOGA) and her partner Tori, NECTAR JUICE is an unpasteurized blend of cold-pressed juices that are focused on your Ayurvedic Doshas. Not only are they focused on that form of cleansing and wellness, Nectar also is designed in mind for the Yoga Communities and able to provide the student with Hydration (Green blend), Strength (Red Blend with Beets) and Balance (Yams with Ginger). These three flavour offerings provide you to feel energized after a hot or power class, neutralized after a yin yoga class or boost your immune system when feeling a bit lower morale with/out a illness! Whenever I am at YYoga and need some sustenance, DON’T BE FOOLED BY THE SMALL 8oz BOTTLES – they are like a TONIC/ELIXIR in which less is MORE and feel free to dilute them with water and it’ll still give you the same absorption to the blood stream and last longer at that. 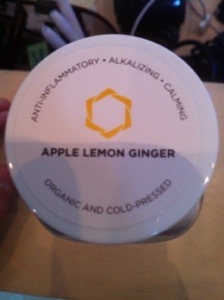 The Juice Box is also locally established and I first discovered it at FLOAT HOUSE in GASTOWN! They offer their juices by delivery to your door including full on cleanses or monthly Juice inventories for your daily intake/diet. Their range of flavours is incredible and I have pictured one of my favourite mixes I tend to have AFTER a FLOAT! I’m addicted to these juices and they also retail around $4.75-5.50 for 8oz and Nectar your paying $7.09 for 8oz. 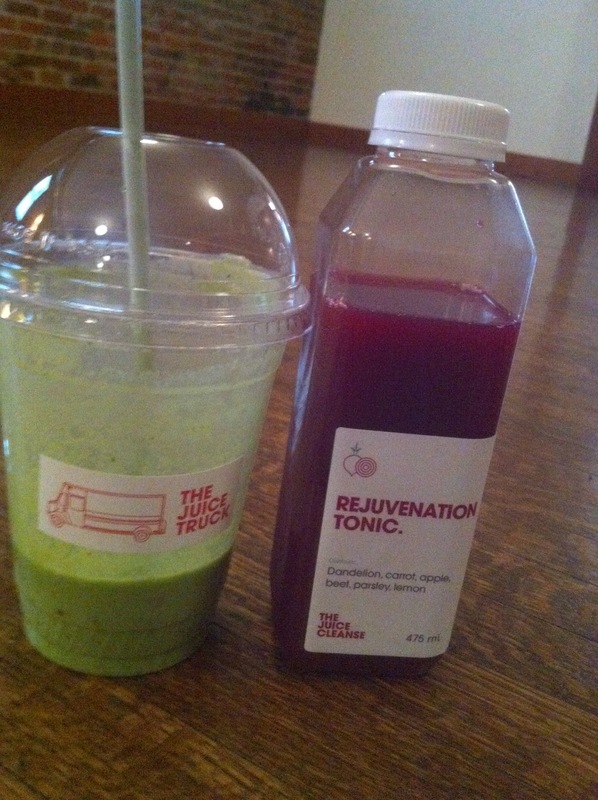 They are both very different juices which is important to mention as they affect the body and your moods differently. 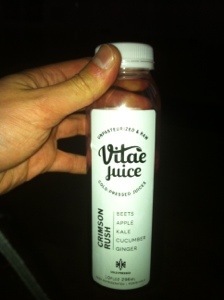 VITAE prices around $5.50-6.50 for the 10oz bottles. One of my favourite blends to fit into my 24oz life factory bottle is taking Juice Box’s: Light Green, Heartbeet and Carrot Orange Ginger Juices. Between them all I am getting adrenaline tonics, greens, anti-oxidants, full vitamin intake and a delicious blend of sweet, tart and spicy elements… It keeps me going ALL DAY with only a need for some protein in the middle for my meals.